OWNER WANTS TO SELL !! Business obligations keep him from using his yacht. 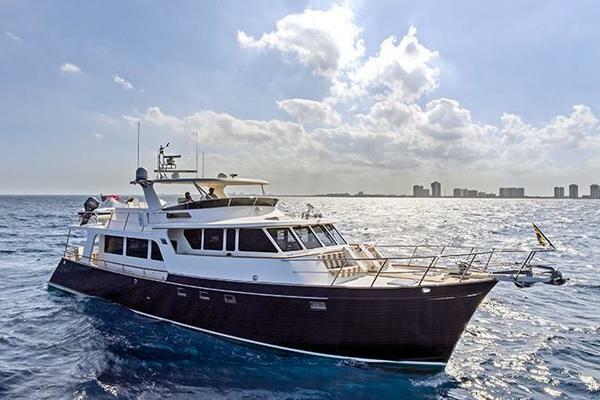 This high quality Maiora Motor Yacht - cruising in the Caribbean between Barbados - Grenada and Trinidad - is ready for her new owner. Just completed Survey / Valuation in April 2018. Newer Onan 17.5 kw Generator. Newer 10' AB dinghy with Honda 10 HP 4stroke. Newer Bimini within last 4 years. New Life Rafts 2014 New EPIRB. New teak deck on swim platform. Atlas convertor adapts to both 110 and 220 allowing travel anywhere in the world. New carpet and drapes installed after photos were taken. "Clear ice" maker - never run out of ice again! Upgraded fire extinguishers througout. Custom rub rails - a real plus when docking ‘side to’. Custom sink / bar area on flybridge. Low engine hours (1,800hrs +/-) Three ensuite staterooms (plus separate crew quarters for two). Master and VIP staterooms are almost identical, full beam, walk around king bedded rooms. She is ideal for two couples wanting equal accommodation. The twin stateroom can easily be converted to a King stateroom for a third couple or great for kids as two twins. This yacht features the garage on the bow for safe and out of the way stowage of the tender, leaving the flybridge open for sunning and relaxing, even when underway. 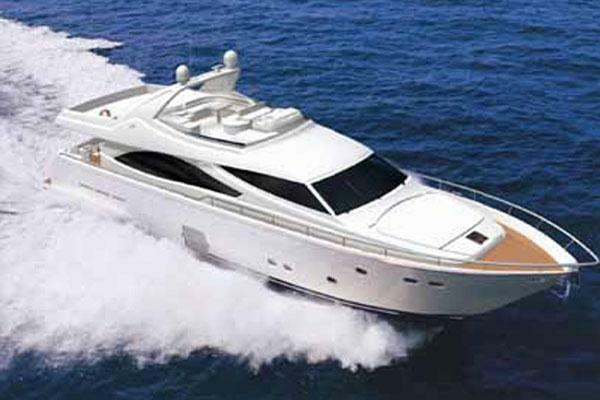 She cruises easily at about 18 knots with top speed of 23 knots, even when waves are kicking up a bit. Custom Aft Deck staircase to flybridge is a fabulous addition designed, built and installed at the Maiora factory. Great Family or Charter yacht! EUROPEAN CLIENTS - come enjoy the sunny Caribbean this winter on this beautiful yacht - then take her back to Europe in the summer!! Convertor plugs in to both electrical currents. For FULL VIRTUAL TOURS of each room inside & out see our multimedia page at yacht360tours.com/maiora20 by clicking the "External Links" button below. This yacht has fabulous space due to its well thought out design. Spacious full beam saloon with windows on both sides provide light and lots of room to relax. The cocktail table has hydraulic lift and extensions converting the space to elegant dining for six guests. Stereo System: Sony MHC-ZX10 with speaker controls salon, aft deck and flybridge. A fabulous feature of this galley is the ability to completly close it off from the rest of the yacht. There is a sliding pocket door between galley and helm plus a side access door from the deck enabling the chef to provision the boat and not worry about having to carry everything through the main saloon. When creating fragrant dishes, the door from galley to saloon keeps those aromas from penetrating everything else on board. A great design! Well maintained by Caterpillar - these engines have impeccable service history. Her full beam master and VIP both have walk around King Beds and are almost identical. This is a great combination for two couples wanting to share the space equally. A third stateroom is set up as a twin bedded room but can easily convert to a third King bed. All staterooms are ensuite. Additional separate crew quarters accessed from bow of yacht with twin beds and separate head. Access to the yacht is made easy with the passerelle with handrails that extends to the dock with the push of a button. Once on board, the open aft deck is ideal for drinks and alfresco dining. The area comfortably seats six guests around the built in table. The sky deck is open with lots of room for lying in the sun. Since the dingy is in a garage on the bow of the vessel, this leaves lots of extra room for lounge chairs, even when underway. The brand new Bimini top provides coverage to the dining and helm area. 220 VAC & 24VDC electrical control panel: Navigation lights, Bilge alarms, Generators remote start, Shore line controls, port & stbd alternator display, service & start batteries display, waste & grey water tanks controls. There are two washer dryer units onboard the yacht. One in the companionway of the staterooms for guest use - the other was added in the Engine room for use by crew and out of the way of guests. This yacht has a CUSTOM DESIGNED AND BUILT stairway from the aft deck to flybridge. Built and installed by Maiora. You won't find this on other Maiora yachts this size.